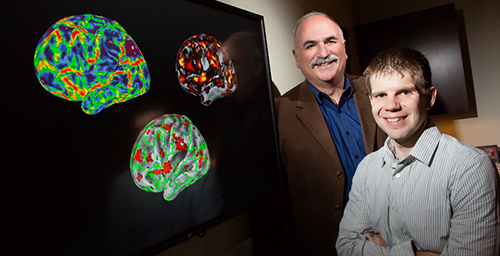 Jim Monti (right) a postdoctoral research associate in the lab of Illinois psychology professor Neal Cohen (left), developed a cognitive task that helps differentiate older adults with very early Alzheimer's disease from those experiencing normal aging. CHAMPAIGN, Ill. - Researchers have developed a new cognitive test that can better determine whether memory impairments are due to very mild Alzheimer's disease or the normal aging process. The Alzheimer's Association estimates that as the population ages the number of Americans living with Alzheimer's disease will increase from 5 million in 2014 to as many as 16 million by 2050. Memory impairments and other early symptoms of Alzheimer's are often difficult to differentiate from the effects of normal aging, making it hard for doctors to recommend treatment for those affected until the disease has progressed substantially.